What are grammar, punctuation and academic language? Grammar and punctuation rules describe the essential structural elements of writing. Incorrect use can cause the message of the text to be lost or confused, and will undoubtedly result in a deduction of marks. Academic language is more formal than the everyday language we use to communicate, but it should still be clear and concise. See the tabs below to learn about ways you can use language to effectively convey your point, and review the Writing Process section of this guide for more information. Active: a type of sentence or clause in which the subject performs or causes the action expressed by the verb. Passive: a type of sentence or clause in which the subject receives the action of the verb. Look for a "by" phrase (e.g., "by the dog" in the example below). If you find one, the sentence is probably in the passive voice. Rewrite the sentence so the subject of the "by" clause is closer to the beginning of the sentence. If the subject of the sentence is somewhat anonymous, see if you can use a general term, such as "researchers", or "the study", or "experts in this field". It is preferable to use the active voice wherever possible because it gives a sense of immediacy and commitment to the sentence. Active: The dog bit the man. Passive: The man was bitten by the dog. What is the difference between "active voice" and "passive voice"? Watch this video to learn how to use the voices effectively. 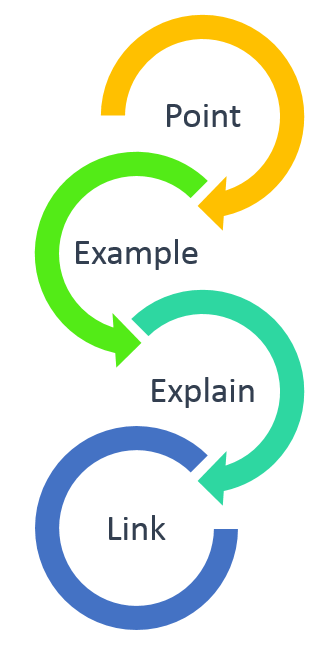 Transition, connecting or linking words and phrases ("signposts") tell the reader where the argument is going and what is coming next; essential for indicating flow of logic and argument. As you read you'll notice these signposts guiding the way. Use the list below to find the right word or phrase to connect, transition, or link the points in your writing. Time links: then, next, while, since and after. Cause and effect links: consequently, therefore, as a result. Addition Links: furthermore, moreover, similarly, in addition. Contrast Links: conversely, but, however, although, nevertheless, and whereas. Adding to a point already made: also, moreover, furthermore, again, further, in addition, besides, above all, too, as well as, either, neither...nor, not only...but also, similarly, correspondingly, in the same way, indeed, in fact, with respect to, and regarding. Writing in lists: first(ly), secondly(ly), third(ly), another, yet another, in addition, finally, to begin with, in the second place, moreover, additionally, also, next, then, and to conclude, lastly and finally. Putting the same idea in a different way: in other words, rather, or, better, in that case, to put it (more) simply, in view of this, with this in mind, to look at this another way. Introducing examples: that is to say, in other words, for example, for instance, namely, an example of this, and, as follows, as in the following examples, such as, including, especially, particularly, in particular, notably, chiefly, mainly and mostly. Introducing an alternative point: by contrast, another way of viewing this is, alternatively, again, rather, one alternative is, another possibility is, on the one hand...on the other hand, conversely, in comparison, on the contrary, in fact, though and although. Returning to emphasise your earlier viewpoint: however, nonetheless, in the final analysis, despite x, notwithstanding x, in spite of x, while x may be true, nonetheless, although, though, after all, at the same time, on the other hand, all the same, even if x is true, although x may have a good point. Showing the results of something: therefore, accordingly, as a result, so (then), it can be seen that, the result from this, consequently, now, we can see, then, that, it is evident that, because of this, thus, hence, for this reason, owing to x, this suggests that, it follows that, in other words, otherwise, in that case and that implies. Summing up or concluding: therefore, so, in short, in conclusion, to conclude, in all, on the whole, to summarise, to sum up briefly, in brief, altogether, overall, thus and thus we can see that. Redundant words are those that repeat a concept within a phrase, and therefore serve no purpose. If you have redundant words in your writing, it is a sign that you need to do some editing. For example, the phrase "the chairs were small in size" is redundant because the reader would understand the meaning if you just said "the chairs were small", as the concept of size is implied in the sentence. These explain not what the word is, but how it is used. Deborah books the tickets for the concert. How do you know which article to use? Or when not to use an article? Watch this video for an overview of the rules. Do your verbs always agree with the right subject? Watch this video for advice on how to get it right, every time. Do you find it challenging to switch from one verb tense to another? 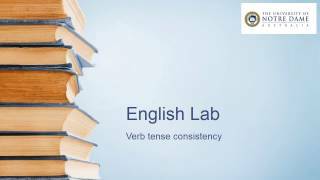 Watch this video to learn how to change tenses without getting confused. How do you know which preposition to use? Watch this video for advice on how to learn and remember prepositions. A sentence is a group of words that expresses a complete thought or idea (makes complete sense), begins with a capital letter, and usually contains a main verb. Every sentence contains at least one main clause. A clause contains a subject and a predicate (says something about the subject). A clause may form part of a sentence, or be a complete sentence in itself. Simple Sentence – contains one statement (main or independent clause). Joe waited for the train. The train was late. Compound Sentence – contains at least two independent clauses, often joined by a conjunction such as and or but. Complex Sentence – contains at least one independent clause and one dependent clause. Joe realised that the train was late while he waited at the train station. While he waited at the train station, Joe realised the train was late. Are your sentences too long or too short? Watch this video to learn how to improve your sentence structure. What is the difference between a clause and a phrase? How do you know if a clause is independent or dependent? Watch this video to learn about clauses in English. A paragraph is a group of sentences that develop one single idea. The topic of a paragraph is stated in a single sentence, at the beginning of each new paragraph, and is called the topic sentence. It introduces the topic and tells what the paragraph is going to be about. The rest of the paragraph consists of sentences that develop or explain the main idea. Introduce and make the point (topic sentence). Support it with evidence, research, references, an example, a quote. Analyse and comment on the reference/example. Explain why it works within the context of the essay question and the argument you are currently making. Link this point to the next point (next paragraph) and to the essay question (main topic). Full stop [.] – used to end a sentence, and for abbreviations or initials. Question mark [? ]– used at the end of questions. Apostrophe ['] – used for contracted words (e.g., I’m = I am), and possessives or ownership (e.g., Lucy’s glasses). Colon [:] - usually used to precede lists or quotes (e.g., I had my bag packed for the beach: sunglasses, hat, towel, and sunscreen). Can also be used to further expand upon or explain a point (e.g., I felt nervous about the diving board: I was terrified of heights). Semi-colon [;] - Separates two elements of a sentence while indicating a relationship (e.g., I wasn't sure if the shape moving below me was a shark; I had never been in the ocean before). Can also indicate elements in a series (e.g., the team included Bill, an architect; Lisa, a teacher; and Lawrence, an anthropologist.). Do you know how to correctly use commas and semi-colons? Watch this video for some essential academic punctuation advice.